Home > Gifts & Favors > Favors & Little Extras - Under $10 > Party Goods > Drink / Beverage Cups, Coasters & Stem Tags > Birthday Fill in the Blank Cups - 2 styles! These fun 16-oz. plastic tumblers make birthday parties a hoot! Choose from either "My guess is ______'s birthday wish is to _________" or "Getting older is really __________ because ______." 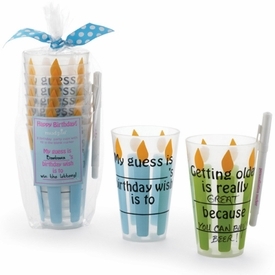 Set of 8 durable plastic cups with one "fill in the blank" marker. Dishwasher safe. NOTE: Only a few left!